“We must make good use of the Net” How many times have you heard this statement? I a million. But what is making good use of social networks? Where is the manual that explains it? Fortunately or unfortunately, the Internet and new technologies are going faster than laws, rules or any foundation before writing. And the age of use of all this is a time, of younger children. My niece two years, knows how to put movies and see the drawings she wants without having to ask their parents. How this happens, it should be given an education on this basis. Because social networks and the Internet, go for long !! Then I tell 9 reasons why schools should teach in children to make good use of social networks. Whatever you do public, notes, pictures, information …. you can always find it, because they remain on the Web with no expiration date. In networks like Instagram or Twitter, for example, you can choose the option that only follow you if you give prior approval. In Facebook, you can choose to only see you friends, and even things like these you cannot tag in photos without your permission. The popularity of a person is measured by the number of friends / followers you have on the major social networks. Your social status is measured by this. And all this, teachers should know, understand and know how to teach in this environment. Often we see atrocities on the Net, sometimes excessive, so teachers should know, and guide students, and how to do, so that what they read do not affects, but believes in them an opinion. Social networks in public speaking and do some of your personal interests and different episodes of your private life, thus, your teachers may know a little more, and even empathize with you. The good / bad the Internet is that someone speaks from his computer screen / mobile but do not know anything about that person absolutely. There are false identities, lies …. you should give examples of this and teach that these situations exist and the risks that have these for you. I’m not saying that is to be avoided, but at least you have to make known the things that have happened previously. And therefore it should be taught to be fully aware of the proper use of social networks. Because when you get older and you have to go out into the real world, the more and better know, the more you do things right. 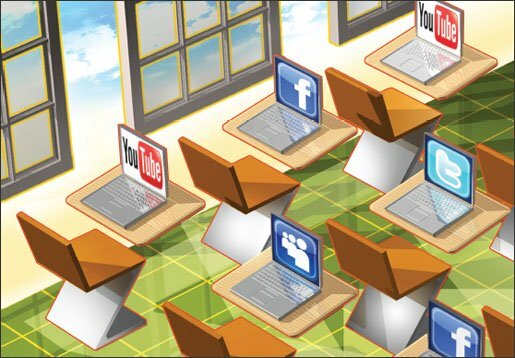 The school is the perfect place to introduce and teach children to make proper use of social networks, as these will be part of your life short, medium and long term.